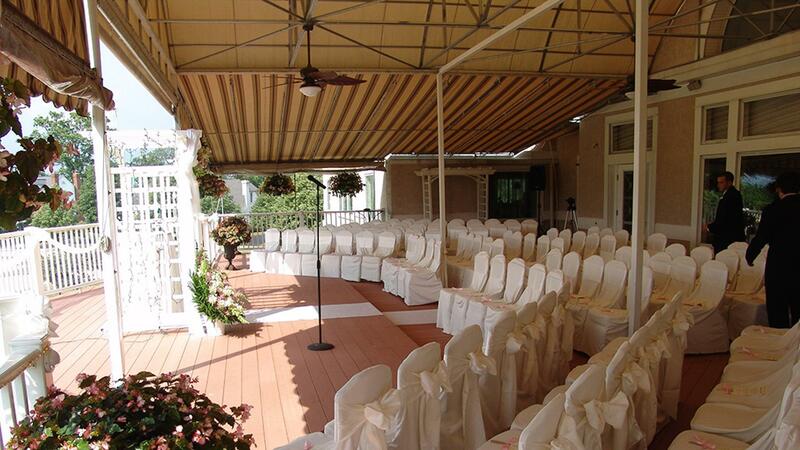 Rent Pine Crest Country Club | Corporate Events | Wedding Locations, Event Spaces and Party Venues. Welcome to PineCrest Country Club, an elegant and sophisticated setting in Montgomery County, just over the Bucks County border, for weddings, meetings and special events. The suburban tranquility and metropolitan sophistication of a lovely country club on a golf course sets up for a flawless day! The stunning Ballroom can accommodate dinner and dancing for up to 270 people while the elegantly appointed PineCrest Room is ideal for a smaller dinner/dance reception and for wedding showers. The beautifully appointed Bridal Suite accommodates the bride’s and bridesmaids’ preparations. Last minute photographs and going away preparations are held on The Deck adjacent to our PineCrest Room, adding just the right touch for your event. Over 1,800 sq.ft. overlooking our 9th and 18th hole makes it the perfect place for your ceremony, cocktail party or that perfect photo moment. The Sports Bar & Grille is a relaxed setting for a bachelor party or to enjoy a cocktail or a light fare prior to your event. Our wedding packages feature contemporary menus that can be altered to suit your own personal style. Meet with our baker to create the wedding cake of your dreams! We can accommodate special menu requirements, including Kosher and ethnic foods.Your event will be the exclusive focus of our chef, trained bartenders, and banquet staff. When the agenda calls for a meeting break, PineCrest presents thoughtfully prepared snacks and beverages for a refreshing pause in the day’s business. Lunch and dinner meetings are truly special events. The bringing together of two people in marriage is one of the most significant traditions for every culture and religion. At PineCrest, we are proud to offer our beautiful venue for your Indian or South Asian wedding. We're honored to be of service in celebrating these enduring customs as you begin your life journey together. From the moment you meet with your South Asian wedding specialist, the creation of your unique wedding event begins to take shape. We are truly happy to blend old and new traditions to cultivate a large or intimate ceremony and reception that is yours and yours alone. In addition, our staff can transform any space into one that reflects the honor and respect of your customs.